Create a Minky Tag Blanket! 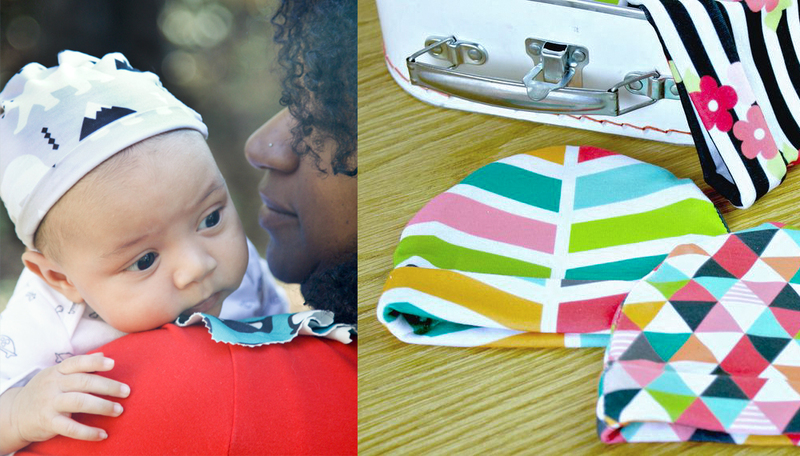 Need a quick and easy DIY to stitch up for a sweet little baby? 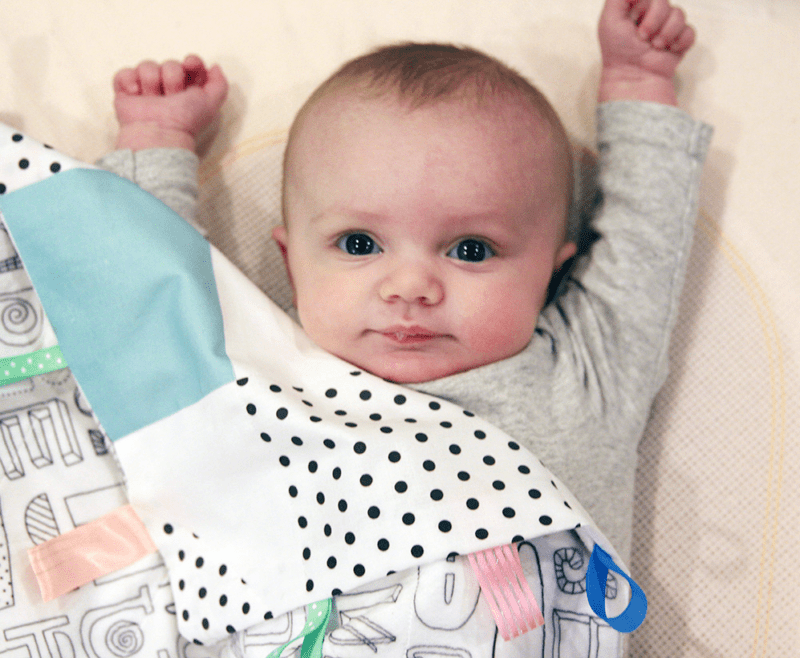 Spoonflower crew member Allie visits the blog to share how she whipped up a tag blanket for her new niece! A tag blanket is a quick and easy project perfect for a new baby. This project takes no time to whip up and makes a great baby shower gift or present for the newest child in your life. The best part, you can get four out of a yard of Kona! Make tag blankets for everyone! For this tag blanket sewn up for my sweet niece, I used Ivie Cloth Co's Old Maid's Puzzle Cheater Quilt // Polka Dot Aqua and Ankepanke's Letters. [Read more…] about Create a Minky Tag Blanket! Here at Spoonflower HQ winter has officially arrived. Get cozy and prepare to hibernate for the rest of the cold weather with cute floor pillows created using our Eco Canvas. These pillows add a pop of color to your space, and they are oh-so-cozy for lounging through the cold months ahead! Spoonflower crew member Kelly shows us how she stitched up a couple for her sweet niece and nephew. My niece and nephew are all about comfort. When I saw some floor beds made out of pillows on Pinterest, I knew had to make them some! I started out by finding a few prints that I thought they would like. I decided on A Bear Camp by Demigoutte and Burnt Orange Wide Stripes by Sweet Zoe Shop for my nephew. He is on the verge of a camping themed big boy room, so I thought it would be perfect! Then I chose Vibrant Floral Garden by Oksancia and Purple White Petite Polka by Scrummy for my niece. She is all about everything pink and purple, so how could I go wrong? 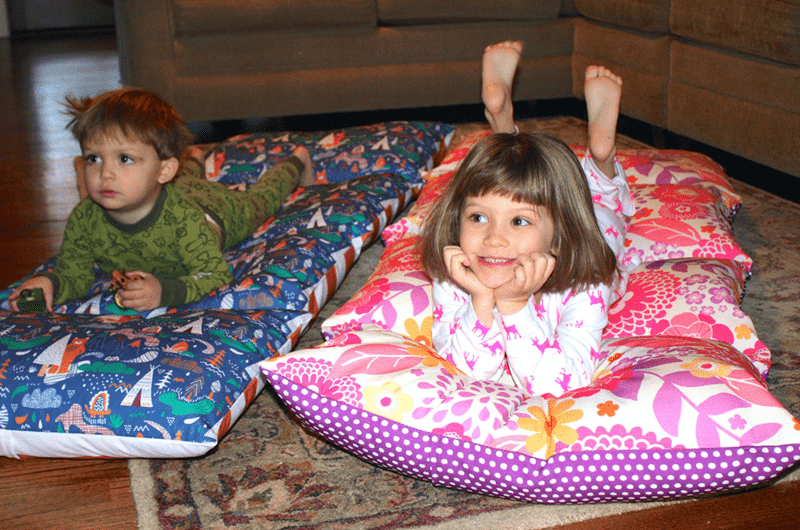 [Read more…] about Create Cozy Floor Pillows! Kick off the new year with a new organization tactic for your dirty laundry. Samarra Khaja (SammyK on Spoonflower) visits the blog to share a creative project that makes sorting laundry as exciting as it can be. Do you or does someone you know (*I’m lookin’ at my little children here*) have a problem getting their dirty laundry into the laundry basket? Does it seem like an endless battle to get those stinky socks on their way to a much-deserved wash? Since the answer is probably yes and because laundry isn’t usually the most smile-inducing activity on the planet, I thought it was about time to give my kids (and you) a good reason to sort the laundry. Plus, it’s another fun excuse to sew something decorative and functional all in one. What are we talking about exactly? 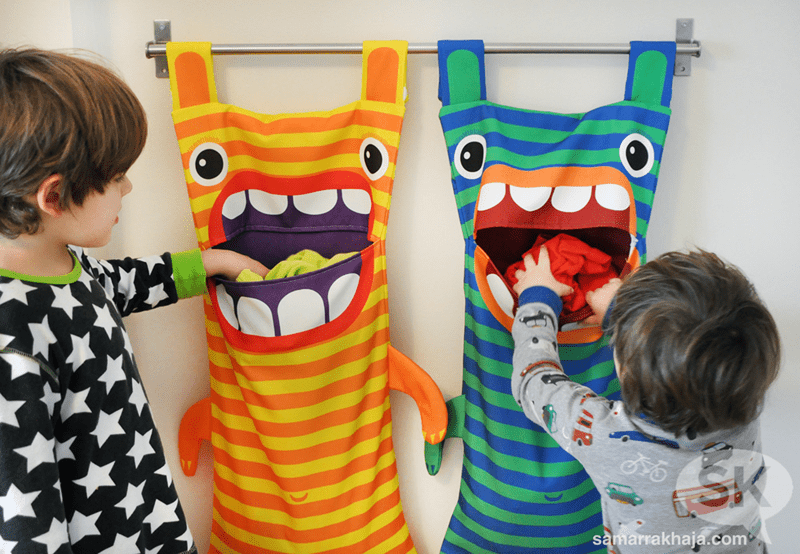 Hungry Monster Laundry Bags! A handmade tote is the perfect gift for any occasion, not to mention a stylish way to help the environment by skipping the plastic grocery bags on your next trip to the supermarket. Jamie Lau, Brooklyn-based writer and designer, shares how to create a lined and reversible tote that’s perfect for transporting gym clothes, your farmers market haul or everyday bits and bobs! Jamie: One of the early sewing projects I worked on when I was first learning to sew was a lined, reversible tote bag. This is a great beginner project for those still getting familiar with their machine, or looking to perfect those straight stitches and backstitching. Or, if you are brainstorming handmade projects for the upcoming holiday season, this is a great opportunity to personalize your gifts using your own textile designs printed on Spoonflower fabric. For the exterior of the bag in this example, I selected the Eco Canvas using my Electric Cranes print. For the lining, I chose Cotton Poplin printed in the vermilion colorway of my Silver Ribbons Star print (for additional colorways, click here). 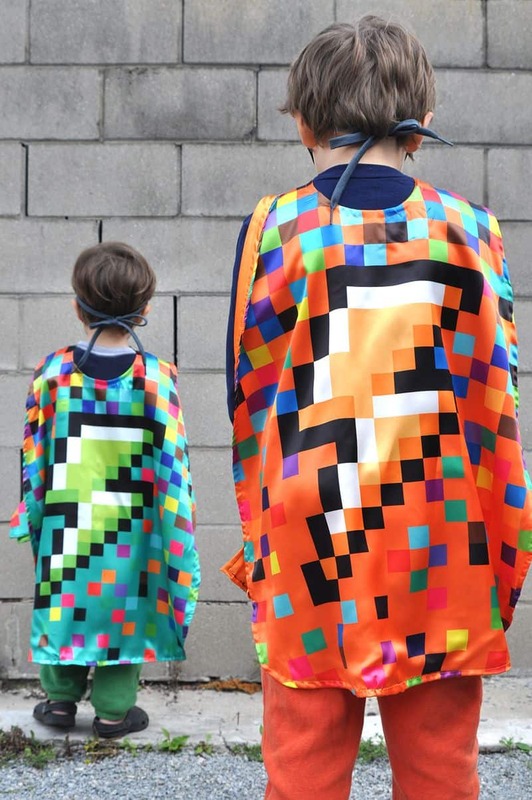 We are pleased as punch to have Samarra Khaja (SammyK on Spoonflower) visit the blog today to share the superhero capes she made for her boys! Peek in at her design process and get tips for sewing your own with our lustrous satin fabric. You can order Samarra’s cape set to sew up for your own dynamic duo, or design your own! Read on for this crazy easy costume DIY plus a bonus link to learn how to make Samarra’s applique version. Here’s a project that’s not only easy and perfect to make for Halloween, but it’s one that will get great use throughout the year, because what self-respecting kid (or adult, for that matter) would ever EVER pass on the random opportunity to dress up as a superhero on any given day? 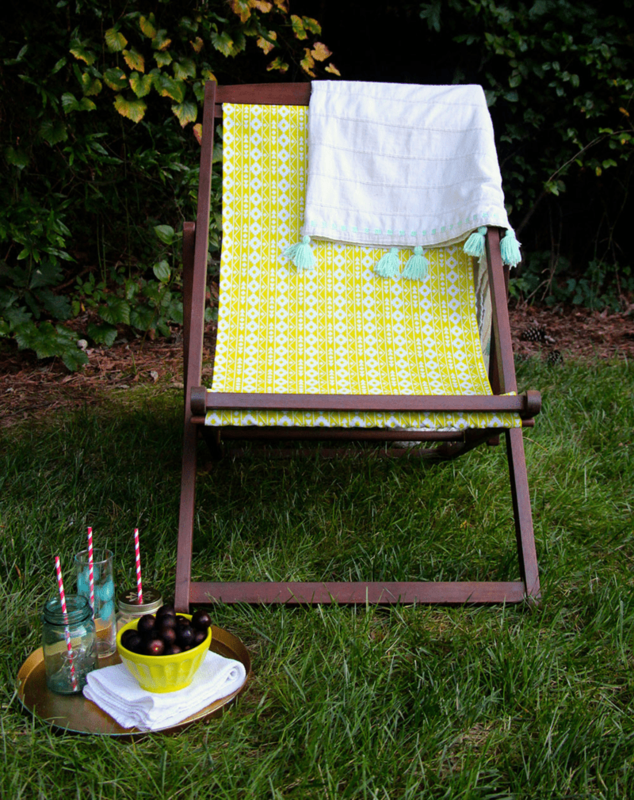 See how Spoonflower crew member Allie made over her plain beach chairs with our new Eco Canvas and get the steps to DIY your own outdoor sling chair! ALLIE: Given a choice to spend time indoors or out, I'm likely going to choose to be outside (humidity dependent– we are in the South after all!). And hanging out in the great outdoors is much more enjoyable when relaxing in a beautiful chair. I was surprised when finding something I liked proved to be difficult. Enter Eco Canvas— the perfect durable fabric for updating simple wooden chairs. Read on for my five simple steps to make over inexpensive sling chairs for your outdoor space! We recently added a new durable, eco-friendly canvas fabric to our line, Eco Canvas! Made of 45% recycled content, Eco Canvas prints colors super vibrantly and is heavy duty enough for a wide variety of projects, just like this fun beach tote from Sara of Radiant Home Studio. 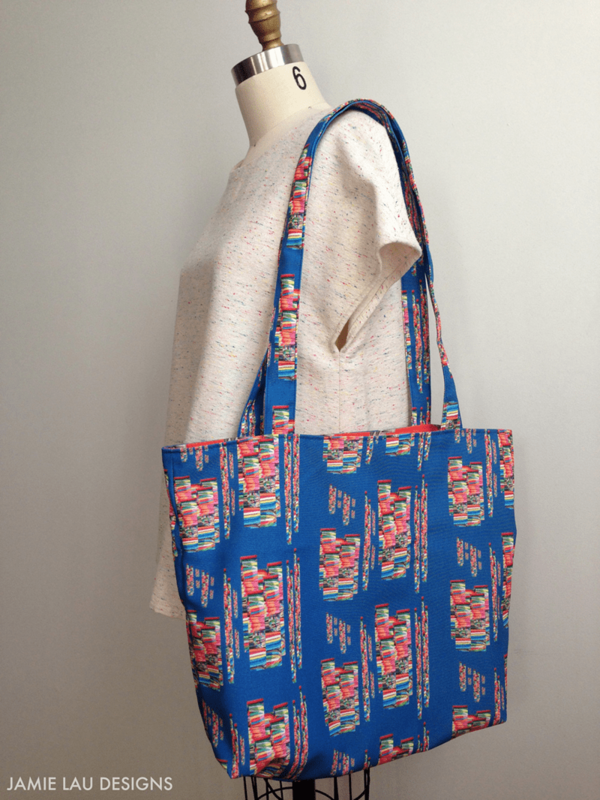 Read on to learn how to sew this versatile carryall! 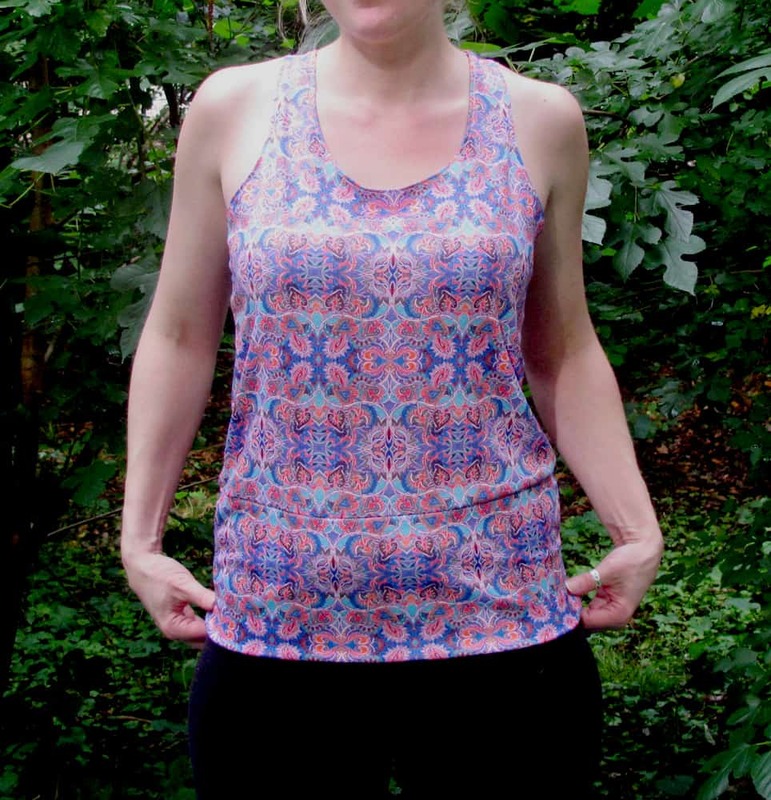 Learn to draft your own sewing pattern and sew a yoga top in performance fabric with Spoonflower team member and independent clothing designer Jamie Powell! The idea of creating your own sewing pattern can be intimidating but it shouldn’t be– you probably already have everything you need to get started! This tutorial will guide you through making your own yoga top using our new Perfomance Piqué fabric, but I also hope that it will serve as a helpful introduction to creating your own custom-fit garment patterns. One of the great things about the Performance Piqué is that it’s stretchy and lightweight, and stretchy fabric can give you a little leeway in fit and drape that you won’t get from woven fabrics. Jamie Powell, Spoonflower team member and independent clothing designer, visits the blog with a new tutorial for sewing up a simple jersey tank– the perfect addition to your warm weather wardrobe! Jamie: Every girl needs a go-to basic top for each season– the thing you can throw on with a pair of jeans and look fabulous without any effort. With summer fast approaching, I give you: my basic scoop neck tank top. 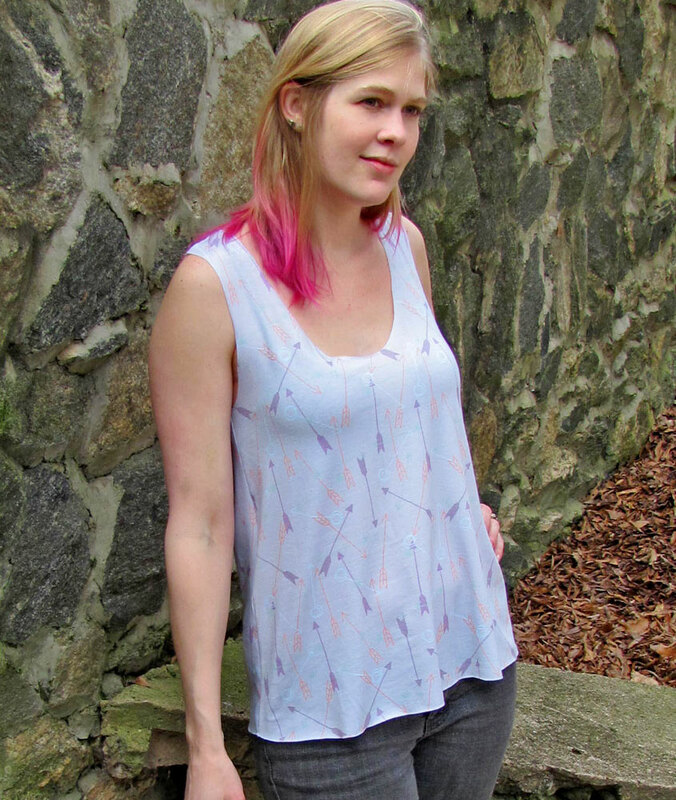 This a-line, u-shaped hemline tank is flattering in all the right places, and is so easy to make, you can whip it up in a single sewing session.